Have you ever been stuck in a scene and your trying to describe a certain emotion, but you’re sick and tired of using the same emotions over and over, or tired of the heated gaze and clinched fists being the sum of your character’s physical show of anger? Well, guess what? 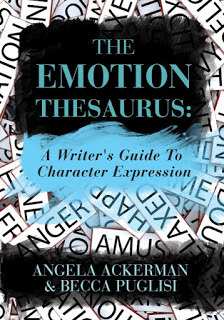 Some smart ladies Angela Ackerman and Becca Puglisi came up with a nifty cheat sheet of 75 different emotions you can dive into and get a whole list of physical cues to break up the monotony of those glares and fists. On each page of The Emotion Thesaurus: A Writer’s Guide to Character Expression there is a definition of the emotion, a whole list of physical cues, some internal sensations, mental responses, cues of acute or long-term effects of the emotion, a may escalate list (of different emotions the original emotion might cause), cues of what may happen when suppressing the emotion for too long, and even a neat little writer’s tip box to enhance the emotion in other ways.